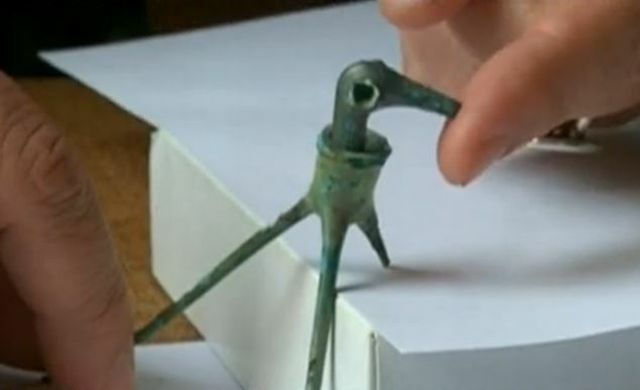 An Ancient Thracian bronze artifact in the shape of a stork’s head described as “the oldest children’s toy in Europe" has been identified by Bulgarian archaeologists among archaeological items found by local residents in the area of the southern town of Zlatograd in the Rhodope Mountains. 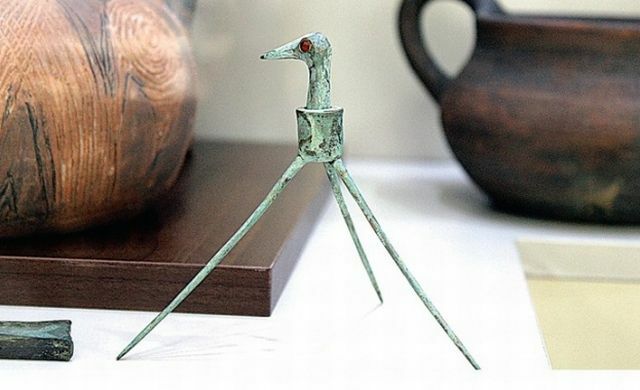 The Thracian toy is made of bronze mixed with some silver, and is dated to the Late Bronze age, about 1500-1200 BC, the period of Ancient Troy and the Civilization of Mycenae. 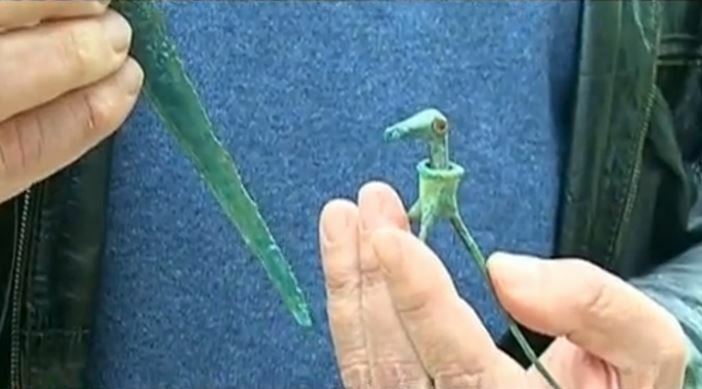 It consists of a tripod holding what appears to be a stork’s head which can move and “drink water"; it weighs 30 grams. The stork’s eyes are made of carnelian – a semi-precious gemstone found in the Rhodope Mountains in Southern Bulgaria, reports the Bulgarian National Television. The 3,500-year-old bronze children’s toy has been discovered by locals near the town of Yagnevo, Kirkovo Municipality, and together with other archaeological artifacts has been bought out by local businessman Alexander Mitushev, a collector who owns a private ethnographic complex in the town of Zlatograd. 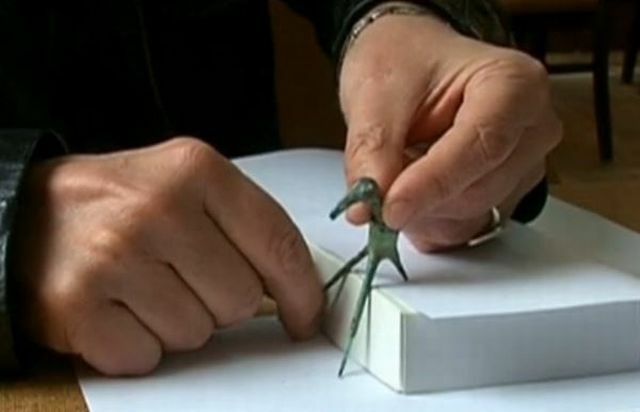 The ancient stork figure has then been identified by archaeologists and historians, and studied before its presentation to the public by Bulgarian archaeologist Prof. Nikolay Ovcharov and Alexander Mitushev who has registered it as part of his private collection in the Stoyu Shishkov Regional Museum of History in the nearby city of Smolyan. Bulgarian scholars, including Assoc. Prof. Krasimir Leshtakov who teaches prehistory and archaeology at Sofia University “St. Kliment Ohridski", believe that the artifact is the only children’s toy found the Late Bronze age found so far, and the oldest known children’s toy in Europe. According to archaeologist Nikolay Ovcharov, it is also possible that the bronze stork may have had a religious meaning. “The so called toy is so called because experts on the Bronze Age cannot figure out what [else] it could have been because no such artifact has ever been discovered in the world. Based on the existing publications, Assoc. Prof. Krasimir Leshtakov is positive that no such thing has ever been found," Prof. Nikolay Ovcharov has explained, as cited by the Bulgarian National Radio. “It is hard to say what exactly it was used for. It may have been a regular children’s toy but it is also quite possible that this item had some kind of a function in the religious practices of the Ancient Thracians, for example, with clairvoyance. However, we have no way of knowing much about that because this period, the second millennium BC, was a time devoid of the written word," he adds. 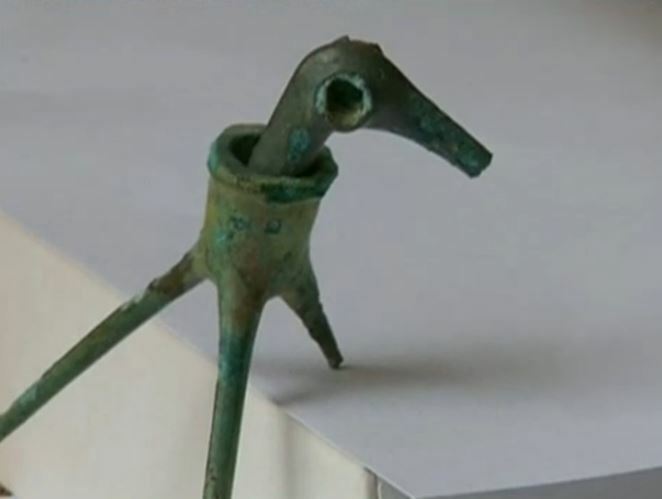 It is no accident that the Ancient Thracian toy stork from the Late Bronze Age was found near the town of Yagnevo because several Thracian sanctuaries and rock tombs have been known in the area. Ovcharov has announced that in the summer of 2015 archaeologist Assist. Prof. Lyuben Leshtakov, who is Prof. Krasimir Leshtakov’s son, will carry out excavations on the site near Yagnevo where the alleged Late Bronze Age toy was found. The excavations will be funded by Mitushev. Mitushev has been buying archaeological artifacts from the locals for the past 15 years, reports the Standart daily. He presently has a collection registered with the Smolyan Regional Museum of History, with an exhibition of the replicas of the artifacts in a hotel he owns near Yagnevo. The 3,500-year-old bronze stork has been presented to the public during a round table in Zlatograd on the development of cultural tourism in the Rhodope Mountain. It has been shown together with another archaeological artifact – a Late Bronze Age Thracian ritual knife for cult sacrifices, which, in Ovcharov’s words, “is interesting but is not unique because there are many others like it in Bulgaria." According to the archaeologist, these archaeological artifacts testify that the 2nd millennium BC was a period in which the Thracian civilization blossomed in the Rhodope Mountains, with its largest cult centers being the rock sanctuaries of Perperikon, Tatul, and the so called Uterus Cave, among others. Ovcharov has also made it clear that in the summer of 2015 there will be archaeological excavations in more Thracian rock sanctuaries in the Rhodope Mountains near the town of Maglyane, Kirkovo Municipality, and in the place known as Harman Kaya near the town of Bivolyane, Momchilgrad Municipality. The excavations near Maglyane will also be funded by local businessman Alexander Mitushev. “More [Ancient Thracian] items and monuments will be discovered. This year I hope we will have details from two more of those from the area of Maglyane which will give us more information about this extremely interesting history from the period of Troy and Mycenae," he says. To illustrate his point, Ovcharov adds that this was the time described by Homer in the Iliad and Odyssey when the Thracians, their wine, and the magical Rhodope Mountains were cherished; the Thracians’ Rhodope Mountains were also mentioned by Herodotus who described them as the “Holy Mountain" together with the central sanctuary of god Dionysus discovered by Ovcharov in the rock sanctuary in Perperikon. Any mother can tell you that deadly object is not a toy. The long, sharp legs were meant to puncture something, probably not a child.